In the seventh issue of Modern Wedding DIY magazine, we focus on all things romance - for your wedding and in everyday life. We filled our pages with projects, ideas and inspiration to make your wedding and relationship beautiful! DIY weddings aren't all about arts and crafts. We share our wedding planning and budget tips for those whose strengths lie in organisation, and for the stylists, we've taken this seasons new it item - the black plate - and shared three different styling looks to inspire your wedding tabletops (page 23)! Kitchen queens should start their sweet journey on page 38 with our inspirational delights from the kitchen! Learn how to bake and ice your very own dripping cake (page 46), make delicious biscuit bonbonniere from around the world (page 40) and the cutest love heart cookie favours (page 50). Embrace your bohemian side with our eclectic bohemian details feature (page 76) that will take you through crafting your very own anklets, dream catcher place cards and juju hat décor! Get the best new floral inspiration and projects that use flowers from your garden and thrifty bits and pieces with our wedding blooms (page 84) feature. 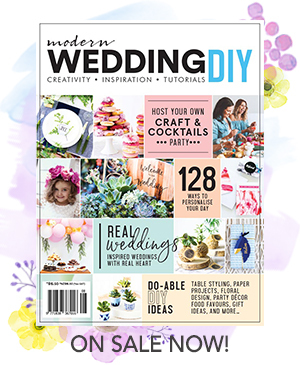 To see how your DIY efforts can fit into the big picture of your wedding day, check out our featured real weddings (page 52 and 92) that are filled with stylish DIY details! Of course, we share the most amazing DIY projects for your wedding that are so pretty you'll want to use them everyday! From marble easy contact paper projects (page 118), artsy air-dry clay dishes (page 59), candle favours (page 74) and wooden vow books (page 108) we've got all styles and abilities covered! Like all things beautiful need care and attention, so to does a beautiful relationship so along with our usual features we've included sweet features on maintaining romance (page 20), planning a romantic picnic date (page 56) and the art of writing a love letter (page 144). There are so many more inspirational features and projects in the magazine. We are seriously in love with the romantic issue and we hope you will be too! Grab your copy at the Modern Wedding magazine shop or at selected newsagents, Coles and Woolworths. Let us know what you think and share pictures of your projects at @modernweddingmagazine on instagram and @modernweddingmagazine on Facebook! ps. is you're looking for any templates and print-outs mentioned in the issue, you'll find them here!